Search is changing again? Oh, wonderful! You can’t sit still in digital marketing because neither our online culture nor the gatekeepers thereof (looking at you, Google and Facebook) are set in stone. And that means that in addition to the ongoing tweaking of your SEO strategy, once in a while the need for a major overhaul comes around. And if you want to stay ahead of the competition, you need to make sure you address this need in a timely manner. The latest such revolution is voice search, and as you may have noticed: it’s already happening. Those lucky grown-up kids who unwrapped an Amazon Echo or comparable device beside the Christmas tree last December were just the latest to join the trend. Voice options have been available across a number of devices for years now, but only after the last few months has voice search asserted itself as the new normal. And if it has a way to go yet before it can truly wear that crown, voice search's unstoppable ascendency is in full motion. Next year, half of all searches will be voice searches. Two years after that, voice commerce is predicted to top $40bn. It’s time to get on board. So what do you have to do to get ready? The first principle for voice search optimization is that second place no longer cuts it. SEO is about to get serious, as can be witnessed in the way that Google already calibrates its algorithms for voice search results. And key among tips to get your results listed first is the speed at which your site loads. Sure, you’ve already driven your colleagues hard to get that site streamlined, but now is the moment for a complete revamp. Ensure that images are optimized for quick loading, and optimize browser-caching so that return users needn’t reload static assets more than once a year, if appropriate. It could be time to go for that server upgrade your company has been thinking about, too. It’s an investment that will pay off dividends when Google notice how snappy your site has become. While you’re telling your tech team about that overhaul they need to do, you might also mention the security needs tightening up. The vast majority of sites at the top of Google’s voice search results are HTTPS as standard. Help Google and potential customers to learn to trust your service by ensuring the requisite security measures are in place. Finally, something marketers can do themselves directly to get their site voice search-ready. Think about the casual user sitting on their couch thumbing a query into their iPhone as they watch TV; now think how much more casual they’ll be when they’re just yelling out the things that puzzle them as they cross their mind. Yep, voice search is the preserve of natural language and conversational queries. That means a concise, accessible FAQ that covers a broad range of topics (relevant to your fundamental keywords) is an ideal source for Google to flag up when users ask questions. Keep it short, simple, and to the point, and Google will want to deliver your answers to searchers. Over half of Google’s voice search results deliver a ‘snippet’ – a paragraph, list, or table that Google believes to encapsulate an answer to a question that a lot of users are asking. Of course, Google decides which parts of which websites become snippets, but you can still do plenty to give your website’s information the best chance of being featured. For a start, prioritize topics that your site already ranks for. Google recognizes that you’re an authority on such subjects, so if it finds you have answered a relevant question it is more likely to excerpt your data as a snippeted response. But Google also needs to find and contextualize that information so it’s sure not to be promoting irrelevant data. A well-structured website (with meaningful internal and external links), well-structured pages (with headers and a sensible narrative) that are easy to navigate, and the use of tables and charts are more likely to make your content suitable. It’s also worth noting the ideal length of segments you hope to be snippeted: chosen paragraphs are usually around 50-100 words, lists feature 7-8 items, and tables have less than 10 rows and 2-3 columns. You should already be on this one as a digital marketer, but just in case you missed it: get your business listed on Google! Head to google.com/business to get your free profile so Google knows exactly what you’re about and gives you fresh ways to connect with local customers. Ready to get started on that overhaul? So you don’t forget anything, try working through this new visual guide as you optimize your site for voice search. 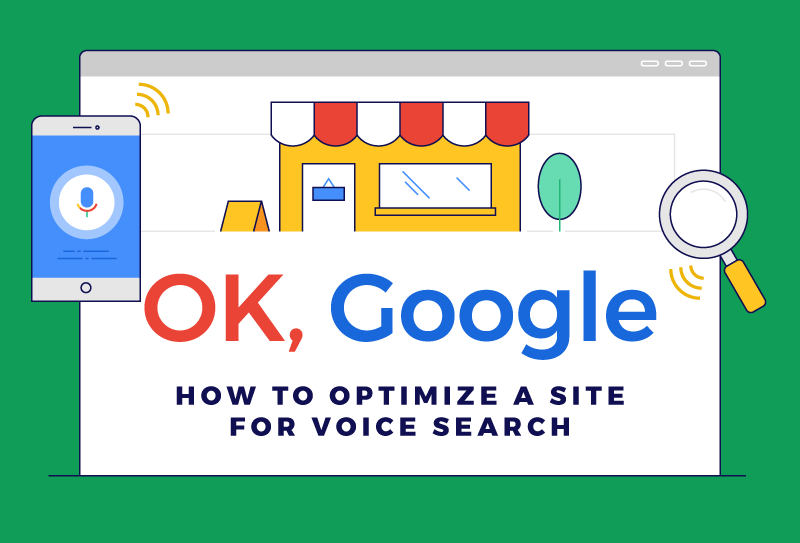 OK, Google: How to Optimize a Site for Voice Search (infographic).